EKM 485Bee - Zigbee Wireless Node for RS-485 Mesh Network | EKM Metering Inc.
Make any EKM-Omnimeter into a wireless submeter. The EKM-485Bee replaces the hardwired links in your RS-485 network with wireless zigbee mesh links. Use this device if you are unable to run wires between meters or between meters and the communication converter. You can have one meter per 485Bee or 256 meters per 485Bee to make a mesh network. 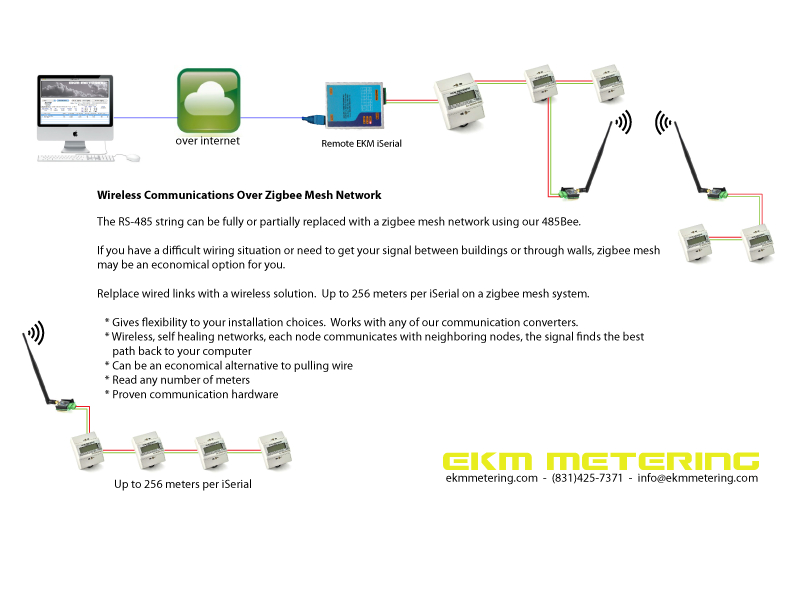 Works with our 9600 baud EKM-Omnimeter v.3 and v.4 meters only. Does not work well with the slower communication speeds of our legacy v.2 meters. Range of 200m with the supplied antenna. This can be extended to up to a mile line-of-sight by using focused high gain antennas. This item includes the 485Bee, the 900 MHz Digimesh RP-SMA Radio, and the 900 MHz antenna. The 485Bee powers the radio and supplies RS-485. Radios come pre-configured to replace the RS-485 communications wire. These are designed to be used in areas where it is difficult to run an RS-485 communication wire. You will need at least 2 of these to create both ends of the Zigbee mesh network. Requires 6 to 42 volt DC power to operate. Power can be supplied via the center-positive barrel jack or terminal block connections. Power supply is not included and must be sourced separately. We offer a 12 Volt Power Supply for this purpose. LED Indication of Power, RSSI, RS-485 In, and RS-485 Out. Check out the Communication Diagram showing how the 485Bee can be used to create a wireless zigbee mesh network to connect all of your meters together. You can have up to 20,000 485Bee Radios in 1 mesh network (essentially unlimited). Each 485Bee will strengthen and boost the signal of the mesh network. 485Bees can also be setup to be on different channels if you want to have separate networks in the same physical area. Is it possible to feed one push with two omnimeters, one wireless and one hard wired? If yes is there a diagram showing how this would need to happen? Has this device been submitted for type approval in either Australia or Papua New Guinea? No, the 485Bee does not have any certifications related to Type Approval in Australia or Papua New Guinea. Can this be mounted outdoors, and do you have a mounting enclosure for it?